The Frog And Pig Split For Ratings. Color Me Not Amused One Bit | "DESTROY ALL FANBOYS!" 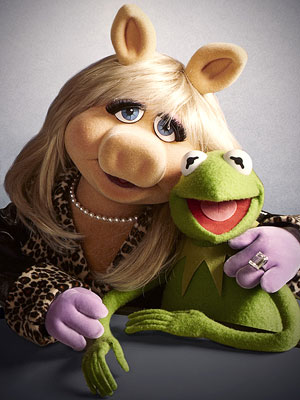 I really shouldn’t care a whit about this, but it’s bugged me that the media has fallen over themselves to make the Kermit-Piggy “divorce” a story as if it’s a real thing. Yuck. Who’s the main sponsor of this show anyway, Ashley Madison? Anyway, why the hell does something as crappy as divorce need to be introduced into a family-friendly set of characters as the Muppets? Yeah, yeah, Sesame Street has done the reality thing as a means to explain some real world situations such as death and prison to its young audience. But in the case of this upcoming ABC show, it smacks of nonsense that’s only there to add a whiff of modern-day “reality” show nonsense to what should have been more of a throwback to the original variety show. Ugh. On the other hand, I guess I should have seen it coming as both Kermie and Piggy have had someone else’s hand up their butts for decades. Speaking of Sesame Street, the HBO deal? Great for subscribers to HBO but terrible for anyone not getting more than basic cable. Between that (so long, low income viewers!) and the shows possibly being chopped to half an hour thanks to modern short attention spans, you have to wonder what was being thought about other than money when all is said and done. Of course, that money thing seems to be partially thanks to online streaming wrecking certain home video revenue streams for good. But I guess thinking of (all) the children doesn’t pay the bills unless you deal with the devil in one way or another. Ah well. I won’t be watching the new Muppet show anyway (the concept is s total turn-off to me) and I haven’t watched Sesame Street in years. Well, okay… I lied. Out f curiosity I did recently check out the close to 30 parodies they’ve made over the last few seasons and all are hilarious. Although, I do question the idea of making parodies of mature shows that aren’t for kids at all (Boardwalk Empire, Mad Men, Game of Thrones) because the parodies work TOO damn well. I guess I should be glad there’s no SS parody of The Wire… yet. This entry was posted in 2015, Commentary, DAF, Features, Humor, Updates and tagged "Reality" TV, ABC, Comedy, Disney, Divorce, HBO, Modern Times, Needless Things, PBS, Sesame Street, The Muppets, Why Can't We Have Nice Things?, YouTube by geelw. Bookmark the permalink.